Gwendolyn coached ten seasons as the Betty J. Costanza Head Coach of Womens Track and Field at the University of Pennsylvania. Harris became just the second coach in program history when she replaced long-time program mentor Betty Costanza in 2002. Harris led the Quakers to stellar results, having had at least one athlete reach the NCAA Championships with six different individuals earning All-America status. Overall, Penn athletes have established 170 top-10 marks, 70 school records, 20 individual Heptagonal champions, and eight individual ECAC titles. Penn athletes excelled in the Ivy League classrooms under Harris with 16 academic All-Ivy honorees. Prior to being appointed head coach at Penn, Harris served as head coach of the James Madison University womens track and field program for 17 years. She saw a multitude of success at JMU, coaching 15 All-Americans, being named the NCAA District III Indoor Track and Field Coach of the Year in 1998, and earning 1995 Colonial Athletic Association (CAA) Cross Country Coach of the Year honors after guiding the Dukes to the conference championship. One year later, Harris produced the Dukes first NCAA cross country qualifier in Bethany Eigel. Harris also used her expertise to coach Tiombe Hurd to become the nations top American collegiate female in 1995 and also saw a pair of her former athletes, Hurd and Julie Speights Henner, compete at the 1996 U.S. Olympic Trials. Hurd then competed in the 2004 Olympic Games in Athens, Greece. Harris had a pair of stints with USA Track and Field 1995 and again in 2001. She has been a member of numerous committees including Chair of the NCAA National Championships in Eugene, Ore., in 2001. Harris, who has been a member of the NCAA Track and Field Committee since 1999, also served as president of the Eastern Collegiate Track and Field Association in 1998. 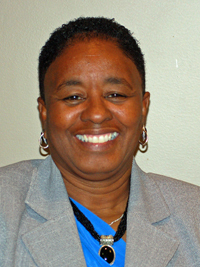 After serving as vice president in 2002, Harris was reappointed to serve as president of the Eastern Collegiate Track and Field Association in 2003. Harris graduated from Delaware State in 1974. Though there were no recognized womens varsity sports at the time she attended the University, Harris lettered all four years as a member of the basketball and played softball, field hockey, and track and field for club teams. In track and field, Harris ran in various events including the 75 yard Dash, 100 yard Dash and 220 yard dash, as well as the 4×100 and 4×200 relays. She also made several regional teams in field hockey and track and field. Immediately following her graduation from Delaware State, Harris coached at Caesar Rodney High School in Delaware where she helped lead the program to four state championships and three conference titles during her six years with the school. Some of girls on the team held state records for more than 20 years. For her accomplishments over the past 30 years, Harris was inducted into the Delaware African-American Hall of Fame in 2002 and was inducted into the Delaware State University Athletics Hall of Fame in October 2010.